Though you might think that you can take perfect shots and line up those shots with just your eyes and hands, even professionals photographers use tripods to keep photos from coming out blurry. While you can pick up a cheap tripod, those tripods often fall apart and come with legs that don’t have much stability. Manfrotto tripos are a little more expensive but well worth the price. The top choice for both amateurs and professionals is the Manfrotto MT055XPRO3 055 Aluminum 3-Section Tripod with Horizontal Column (Check Price on Amazon.com). At 5.5 pounds, this tripod works just as well in the field as it does in a studio. Find out everything you need to know about this tripod and compare it to other models from Manfrotto to see which one is best for your camera. 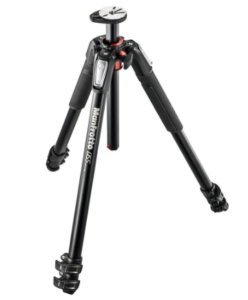 To find the best camera tripod, you can read reviews, look at features and scour the web, or you can take our advice and invest in the Manfrotto MT055XPRO3 055 Aluminum 3-Section Tripod with Horizontal Column (Check Price on Amazon.com), which we think is the best from the brand. At 5.5 pounds, this tripod offers all the support and stability that larger tripods do but at a fraction of the weight and size. 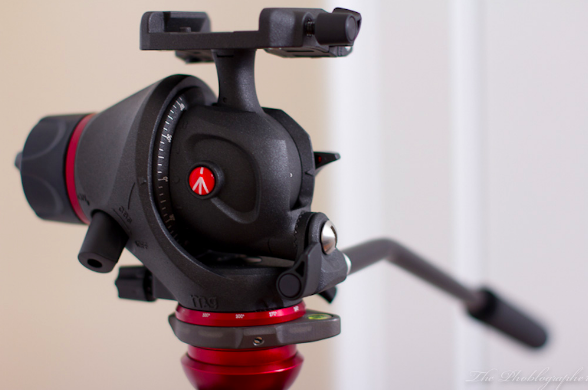 The Q90 center column that comes with the tripod is a separate piece that you can adjust and use with just one finger. The upper disk on top acts like both a plate for your camera and a level. As it has a bubble level inside, you won’t have any problems ensuring that the tripod is stable before taking a shot. Each leg adjusts individually to help you get the right height and angle too. If you like the other camera accessories available from Manfrotto, you’ll definitely like this tripod because it has an Easy Link connection system that makes it easier for you to hook up and use those accessories with the tripod and your camera. You can use this tripods with cameras and camcorders from different manufacturers that weigh almost 20 pounds. 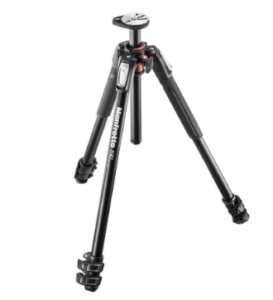 Our top choice for those who want a Manfrotto tripod and don’t care about cost is the Manfrotto MT055XPRO3 055 Aluminum 3-Section Tripod with Horizontal Column, which comes with the durable Q90 column that so many photographers love. Manfrotto completely redesigned this column based on feedback from its customers and created a new center piece that you can set up and use with just one finger or with one hand. This column is unique because you can use it in a vertical or horizontal orientation. The disk used on this tripod acts like the plate found on other tripods and has a universal screw in the center that lets you use it with camcorders and cameras from different manufacturers. While it might look big and heavy from photos, the XPRO3 is only 5.5 pounds and uses aluminum throughout its body and legs. Its closed length is just over 21 inches, and it has a maximum height of nearly 70 inches. With an Easy Link connection, this tripod can serve as the foundation of a mobile studio. This connection lets you hook up loads of other accessories, including reflectors and LED lights when shooting in lower light conditions. Manfrotto designed quick power locks that you’ll notice on each leg, which you can lock and unlock with one hand, but you can adjust the legs just as easily too. 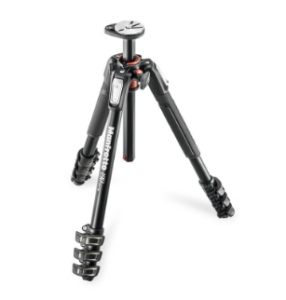 The Manfrotto MT190XPRO4 4 Section Aluminum Tripod Legs with Q90 Column is so useful and dependable that we almost ranked it at number one on our list, and we highly recommend it for those who like the XPRO3 but can’t afford its high price tag. The XPRO4 uses aluminum that is so strong and durable you can carry it into the middle of a storm and use it on the beach without the water damaging the metal or making it rust. That aluminum also helps drop the weight down to 4.5 pounds, but the tripod can still support devices weighing up to 15.4 pounds. With a minimum height of just 3.1 inches, the XPRO4 is great for those who want to shoot nature scenes and those who want to shoot up from low angles on the ground. Its maximum height of 63 inches helps you shoot real people and objects from straight on. If you slide the center column down, the tripod reaches a maximum height of just over 53 inches. Quick power locks provide easy access to the legs and allows you to lock and unlock the legs with just one hand. 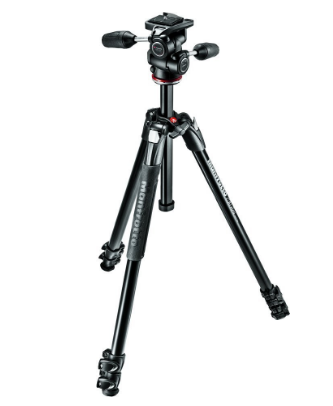 Like other tripods from Manfrotto, this one lets you rotate the orientation between the vertical and the horizontal. The legs on the XPRO4 drop lower to the ground than those found on almost any other tripod. One thing you will notice about some of the top tripods like this Manfrotto MT190XPRO3 3 Section Aluminum Tripod Legs with Q90 Column is that those models come with a Q90 column. This is one of the best columns that money can buy and one that gets extremely high and positive reviews from professionals. You can lift this column up and put more weight on the tripod legs, but you can also push the column down to make the tripod more stable. Built-in angle selections on each leg make it easier than ever to change the angle of the legs based on the shot that you want to take. The legs also feature buckles on the ends that act as snap locks and let you unsnap one buckle to change the length of the leg and then snap the buckle back to lock the leg. You can place your camera on top of the tripod for more traditional shots or put it on the base of the center column to get as close as possible to the ground. The most unique feature of this tripod is that is has a center column that you can use in either a horizontal or vertical orientation, and Manfrotto includes instructions that show you how to use that column. This tripod also has a built-in bubble level and a built-in plug for using it with Easy Link accessories. Manfrotto prides itself on making authentic Italian tripods and making tripods the same way it did for generations, and this Manfrotto MK290XTA3-3WUS 290 Xtra 3-Way Head Kit combines that classic manufacturing with new and more modern amenities. Those amenities include leg locks made from aluminum that are just near the base of each leg. Both of the locks located on the legs have snapping buckles that snap open and closed to let you adjust the height and then set the tripod to that height. Whether you want to take shots of your kids at their next game, your family reunion or photos of a graduation party, you can use this tripod with ease. It comes with a shoulder bag that can accommodate the entire tripod when folded down and any other accessories that you want to carry. This bag has built-in padding to keep the weight of the tripod from rubbing uncomfortably against you and to help you evenly distribute its weight. You may not even notice the weight of this tripod because it weighs less than four pounds. It lets you reach a maximum height of more than 53 inches with the tripod alone or more than 63 inches with the center column engaged. The tripod measures just over 23-inches long in its folded state, which is when you carry it, but you can lower its overall height to just 12 inches when shooting. Many of the other tripods that we included on our list of the best from Manfrotto are larger in size, but this Manfrotto MKCOMPACTACN-RD Compact Action Tripod is worthy of a spot because it’s so compact. This is one of the few tripods that you can literally fold down, toss in your camera bag and take off, but it’s also incredibly easy to set up in the field or the studio too. We also like the red accents on the legs and around the top that help set this apart from other tripods. Designed for use with DSLR cameras, the tripod is suitable for beginners because it doesn’t take much time to set up. It has an attaching screw with a universal design that will work with any camera that uses a standard lens kit from any manufacturer. Buttons and knobs located on the top of the tripod let you quickly release your camera from the tripod and move the camera while still attached to the plate. The Compact Action weighs 2.64 pounds and can safely support a camera of over three pounds. You can reach a maximum height of just over 61 inches with this tripod and fold in the legs to drop that height down to around 17 inches. Manfrotto designed this compact tripod to include a joy stick head on top instead of the ball head found on other tripods. Why is the Manfrotto MT055XPRO3 055 Aluminum 3-Section Tripod with Horizontal Column the Best? The Manfrotto MT055XPRO3 055 Aluminum 3-Section Tripod with Horizontal Column is definitely the best tripod that you can get from Manfrotto today. The Q90 center column is so easy to use that you can make adjustments with just one hand, and it weighs around 5.5 pounds. 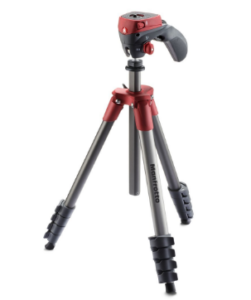 With an Easy Link connection, you can use this tripod with other accessories available from Manfrotto too. Buy The Manfrotto MT055XPRO3 055 Aluminum 3-Section Tripod with Horizontal Column on Amazon.com!